Another example of the creepy-cute paradox? The evidence is before your eyes. It was 2005 in Redmond, Oregon. 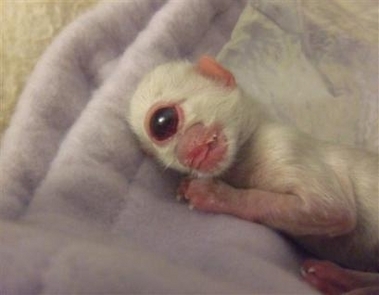 Late one cold December night, a small kitten was born with just one eye, no nose and no eyelid. He was christened Cy (short for Cyclops) and passed away just one day later. Cy’s unique appearance was caused by a form of holoprosencephaly, a brain development disorder that can cause cyclopia — the failure of eyes to properly separate. Its a shame how somethng so amazing can be presented to us then stripped away with in a matter of moments! I just wish the world would look at creatures as such monstrosities instead of a miracle and a form of beauty in nature. Some things just go underappreciated. And at times like this in our day and age we shouldnt take things so extremely and look at them with such horror… B/c god know what kind of things the future is wiling to throw at us! RIP Cy, you would’ve made a great lolcat. Poor thing. nothing shud be treated like that! ooohhhh!!!! wat a sad day…..
What happens if you woke up and that cat was looking at you right in the eyes. Let’s hope there’s more cats like this. ONLY with a longer life span. hey to all u people. Cy waz and still iz amazing. Dont judge him just because of how he looks. U might b the retarded 1 one day cos of a serious accident. Would u like it if were ever u went people screamed: “dear god, that thing (you) is retarded”? Well? Rip 2 Cy may what u had as a life have been a good 1. ’tis really a misery to see kittens die just after they’re born. Any kitten is so adorable whatever be their shade. Augh! I clicked the link to cyclopia wikipedia article and what has been seen can’t be unseen… That deformed baby will haunt me for some time now. To everybody who thinks this is creepy and doesn’t care…They r sick sick people. Nobody wants to share the shame fate as poor little cy. So STOP CALLING HIM CREEPY!!!!!!!!!!!!!!!!!!!!! I’ve joined your rss feed and stay up for in quest of more of your magnificent post.